What Does the Dentist Near Me Think About Flossing? Recently, there has been a lot of news coming out questioning the benefits of flossing. Multiple articles have cited studies saying it doesn’t help clean your teeth, and have pointed out that the 2015 Dietary Guide for Americans no longer mentions it as part of your dental care. Does this mean you can finally stop flossing? One question many people aren’t asking is, “What does the dentist near me have to say?” Seeing as how they know more about teeth than anyone, it would probably be a good idea to ask. Dr. Allison Fowler, a dentist in North Dallas, weighs in on this debate. Despite what you have been reading, yes, flossing is still an important part of keeping your teeth clean and healthy. Unfortunately, the world of scientific studies is not as reliable as it once was, as many journals only publish sensational findings despite scientific merit. Often, these studies don’t hold up to standard peer-review practices and can’t be replicated, which is essential to establishing their credibility. Also, the 2015 Dietary Guide for Americans was geared specifically to address nutrition, namely limiting the intake of added sugar. The omission of flossing in the guide isn’t a dismissal, it’s simply removed to allow room for new information. As a dental professional who has literally spent years monitoring the oral health of patients, I can personally attest to the benefits of flossing. Your teeth are actually quite complicated structures. They each have a different shape, serve a different purpose when you chew, and are composed of multiple layers. Brushing is only able to clean a portion of their surfaces, and flossing helps reach the parts that brushing can’t. When you don’t floss, you are leaving about 40% of your teeth’s surfaces uncleaned. This leaves you vulnerable to tooth decay and gum disease, which can lead to many more serious issues. I have seen hundreds of patients over the years who brush diligently but do not floss, and they always have more problems than the people who floss consistently. The areas between the teeth are just as susceptible to plaque and bacteria as the visible surfaces on the teeth. Flossing helps you clean the entire tooth, and is an essential part of your daily routine. Perhaps you’ve stopped flossing because of the stories you’ve read, or maybe you’ve never flossed. I can assure you that your smile will thank you if you start. You only need to floss once a day and it only takes a minute. Whenever you floss, use 12-18 inches and wrap the ends around your fingers. Gently slide it between each tooth, being careful not to push too forcefully into your gums. You’ll be surprised at how much food gets trapped between your teeth, and you’ll be happy that you’re getting rid of it. 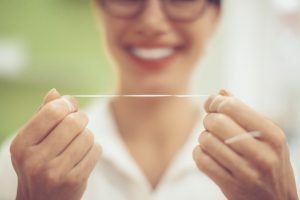 If you’re still skeptical about the benefits of flossing, just read this article posted by another dentist in response to the one linked earlier. It really comes down to this: when it comes to your teeth, who do you trust more? An article on the internet, or your dentist (who is ironically writing and article on the internet). Still curious about flossing? Great! Just give us a call today and we’ll be happy to tell you everything you need to know. Comments Off on What Does the Dentist Near Me Think About Flossing? Located in the Lomo Alto building 2 blocks south of the Northwest Highway & Dallas North Tollway intersection in Park Cities.